It’s a big freaking pain sometimes when I want to make a report of the result of my Windows XP Search. You know when you go and right click on a Drive or Folder and choose “Search…”. It takes a while for the search result to come back and you can’t even save it. Once you close it, it’s gone. Now that I have SysExporter, I don’t have to worry about that problem. For example, I want to find all the PDF files I have on my PC, I can just do a search for “*.pdf” on my local drives and wait for it to finish. Then I lauch SysExporter and choose the correct type in the list. SysExporter shows you more than just your search result. It shows you just about every window you have opened so you need to choose the “Search Results” with a type of “ListView”. Once selected, it shows all the search result in the bottom pane of the application. Highlight all of it and right click and choose “Copy Selected Items (Tab Delimited)”. Now you are able to paste into Excel to save the search result. Windows should have this built in. As you may have noticed, I have a lot of programs and utilities. Of course, I have to get them to my PC somehow in order to install them. Well, I have tried several downloaders and by far my favorite is Net Transport. It’s definitely a foreign company that came up with this but you have to handle it to them, they did a good job. After installing Net Transport, the user can just click on a link to a file and a new menu option will show up that says “Download by Net Transport”. Net Transport would then startup and download the file. If right clicking on the page, the new menu option will say “Download all by Net Transport”. Net Transport would parse the page and list all the available files that can be downloaded. The user can then just check the files and the download will be queued. One feature that I like is the ability to create categories. When downloading a file, the user is given a choice of what category the file is in. The file will then be placed in the folder that is defined by you when you created the category. This particular program is free but it has nagware. Since I blogged about two free anti-virus, I might as well show you two decent free anti-adware/anti-spyware. Lavasoft Ad-Aware SE Personal and Spybot Search&Destroy are pretty good anti-spyware considering they are free. Both of these run pretty well on my computer. I noticed that it is actually pretty good to have both of these installed because what one misses the other may catch. When running this program, it will go through your computer and the registry looking for any suspicious program or entry very similar to that of a anti-virus program would do. Once suspicious entries are found, the program lists them out for you to decide if you want to remove them or not. The program also gives you the ability to backup the changes in case you want to roll back your removal. Overall, these are very decent software to use to help guard against spyware and adware. There’s a lot of gadgets out there to help find wireless access points. They can be handheld devices or small little key-chains that light up when an available wireless network is found. Well, I found this nifty program that does the same thing. It is aptly named NetStumbler. It works best with a laptop that is equipped with a wireless network card. 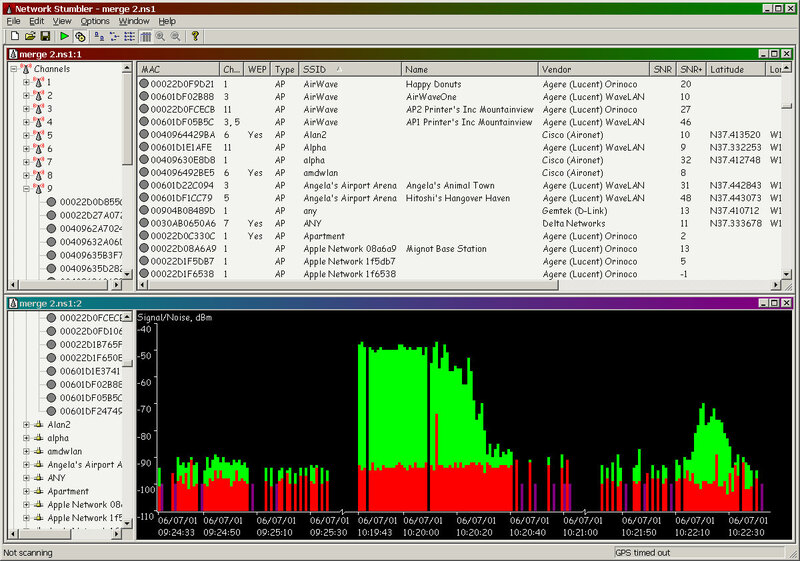 Once NetStumbler is installed, the user can see all the available network within range. The program displays information of the name of the network, the type of router, and how much signal strength is from the network. I have wireless networking in my house but I have certain areas that seems like the signal strength is low. I installed NetStumbler on one of my laptop and walked around the house with it on. By doing this, I am able to find weak spots in my house. I then get another person to help move the antenna around to get better reception. Since I am on the track of freeware, I shouldn’t leave GIMP out of my list even though most of you probably have already heard of it. But for those that haven’t then read on. GIMP is a great free image editor. It stands for GNU Image Manipulation Program and it is of course under the GNU General Public License. The program is much much better than Paint. I think it is slightly better than Paint.Net. GIMP can do the usual things that a good paint program can do like having multiple layers, color manupilation, cropping, and resizing. So if you don’t want to spend $50 or more on a graphic editor, GIMP may be your answer.